Adults take 1 tsp. daily. Adolescents 9–18 years take ½ tsp. daily. Children 4–9 years take ¼ tsp. daily. After opening, refrigerate and consume within 100 days. Store in original container, protect from light. Made in Canada with imported ingredients. sunflower oil, natural flavour, tocopherols (derived from non-GMO soy), green tea extract (mono- and diglycerides of fatty acids, palm oil, ascorbyl palmitate), medium chain triglycerides. 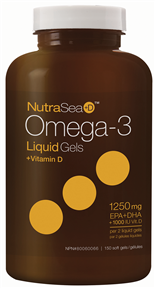 A balanced formula combined with 1000 IU of natural vitamin D.